Schallwellenmagie presents FAKIEDJ – Long live the community! We met FAKIEDJ for the first time on Last.fm, right from the start we knew him as a very active artist and a guy who is always trying to support the electronic music community. 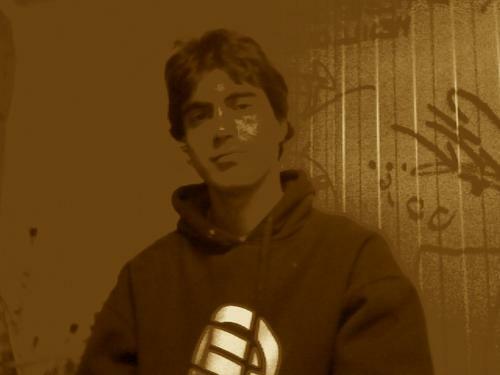 The man behind FAKIEDJ is Felipe Pozuelo Botija and he is living in Alcazar de San Juan/Ciudad Real in Spain. We are very pleased to give FAKIEDJ a platform here at our SCHALLWELLENMAGIE Blog to answer some of our questions and to introduce his track „Fuego Cruzado„. FAKIEDJ: I am part of a musical collective of DJ´s here in Spain. I have always had dates for concerts , but this year i barel had only two dates….Why? Because when organizing the schedule of the concert , in charge of opening the festival provided me , and this implies having to click on the first with little public, this is very hard for me. After several parties with the same problem I decided to go on my own and started producing my own music to satisfy my creative needs. FAKIEDJ: Specially Gui Boratto but also Oxia, Agoria, Extrawelt, Alex di Stefano, MotorcitySoul, I:Cube, Solee, Anthony Collins, Format B, Phonique, Jimpster, Marek Hemmann. Mathias Kaden….and earlier in my years as a drummer : Incubus Deftones Dredg Pennywise Nofx Bad Religion….and many more. Schallwellenmagie: .How long does it take you to produce a track usually and at what aspect of producing you spent most of your time? FAKIEDJ: Normally I play for hours on a single battery until I play the piano with a rhythm that I feel that is consistent with what at that time looking for. After that is giving way to go and listen again from the beginning. FAKIEDJ: Surely mastering and compression of the virtual instruments and samplers, beyond my control, we have much to learn even. FAKIEDJ: To find this point is not difficult. I still do not consider myself a professional but rather a beginner in this cause. I think I have good imagination but I do not have training as a producer, everything is learned on my own. So when a song is close to the original idea I had and that correct term (and no longer go back to change it). FAKIEDJ: I am using several programs for the creation of my songs, Ableton Live, Logic, GarageBand, and others. As a team: a MacBook, Firewire audio interface and two MIDI controllers. FAKIEDJ: My favorite DJ is Richie Hawtin …. certainly two years ago I attended a meeting in Valencia, 6 hours long … amazing. FAKIEDJ: In the near future I will have my own studio soundproofed, with a good sound, computer, and my analog Pearl drums and Zildjian cymbals my dishes with microphones, so combining the two worlds. Do not rule out a future that makes a fairly rare type of direct, combining a Roland electronic drums and laptop. Tags audiohobel, Don Genaro, fakiedj, Felipe Pozuelo Botija, last.fm, Schallwellenmagie, White Zone | Permalink | Kommentare deaktiviert für Schallwellenmagie presents FAKIEDJ – Long live the community!